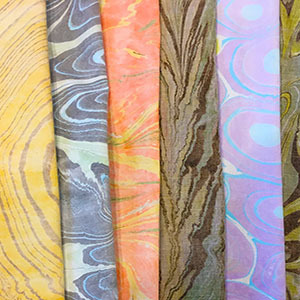 Spend the afternoon discovering the wonders of marbling on fabric! I will demonstrate how to make the thickened water base, how to mix the acrylic paints so they are light enough to float on the thickened water and how to manipulate the paints in different ways to make a variety of marbled patterns. You will experiment with small pieces (6×10”) fabric, and by the end of the afternoon you will have 8-12 marbled pieces to take home and play with. To register email me at artist@lisathorpe.com.